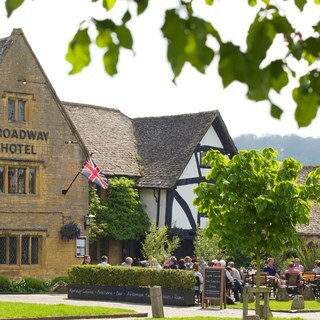 Located in the heart of Broadway, overlooking the village green; The Broadway Hotel offers fine dining and excellent service in a setting that’s loved by staying guests and locals alike. Whether visiting us for a special occasion or simply to sample our seasonal menus, you’ll love our stylish Tattersall’s Brasserie. Join us for a spot of lunch when the Brasserie is filled with natural light from our beautiful glass roof, or indulge in an evening meal where the lights will be dimmed for a more relaxing, intimate atmosphere. 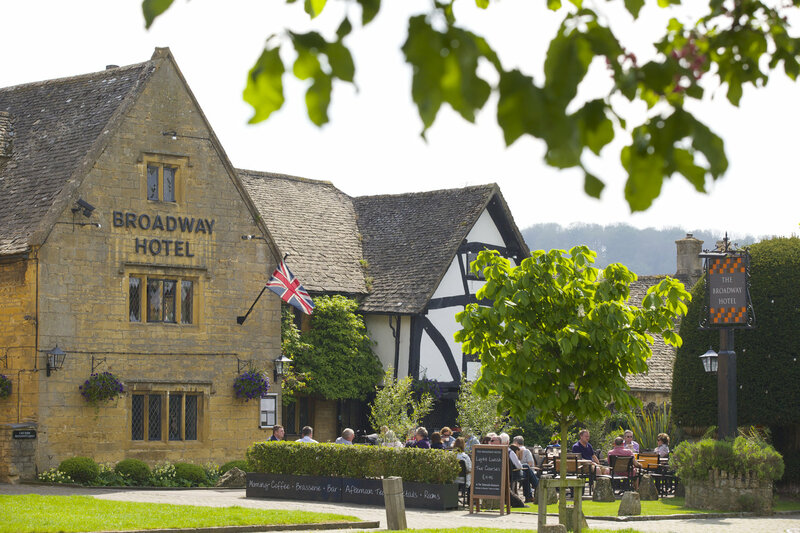 Awarded 2 AA Rosettes for fine dining and Head Chef Erik works tirelessly to produce delicious seasonal menus that showcase the best of our local Cotswolds produce. Contemporary design with some natural light from the glass roof during the day and dimmed lighting in the evening to create an ambiance that is both relaxing and intimate. In the summer months, enjoy the cool air conditioning or dine on our rear terrace located in the Broadway hotel garden. Book now for light lunch, evening meals and Sunday roasts in the Tattersalls Brasserie,please note tables of 8 and over need to be booked direct with the hotel please contact us on 01386 852 401. If you have any specific dietary requirements please don't hesitate in contact us on 01386 852 401. We look forward to hearing from you. The restaurant  had a lovely atmosphere and the staff were as always very attentive. The food was very good, and no-one had any problem with my ordering two starters (instead of a starter & main course), all food beautifully presented & hot. Thoroughly enjoyed my Espresso Martini while my husband ate his delicious desert. Fabulous service. Nothing too much trouble. I have been many times but this was a first for my friend who loved it. I was a bit disappointed the sea bass dish I had seen on the website menu wasn't on but the roast beef was delicious. It is a lovely setting and the food and service is consistently excellent so I am looking foward to returning very soon hopefully. Really lovely Sunday lunch with superb service from everyone. Excellent food and service. A pleasure to dine there. The service was excellent and the food was great. The fixed price light lunch menu was good value especially considering the quality of the food. Our only negative comment would be that the food was slightly too salty for out taste. Fantastic meal and a wonderful evening. The restaurant is very atmospheric, lovely food. The staff were very friendly and welcoming, we enjoyed very much. We were staying at the Hotel and the customer care services was outstanding, well done to the team. Everything was superb. The evening meal was excellent and the accompanying drinks were made to perfection. Loved every minute. Waiter was more than helpful and went out of his way to look after us. Excellent evening and great to see vegetarian dishes, very tasty indeed! Lovely presentation. Very good food. A touch short of excellent. A nice meal but my pork dish required a jus or sauce to bring it together.